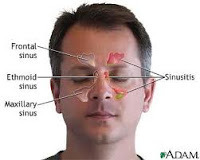 You have probably heard about the disturbance that the nose sinusitis. Disorders of the nose is not always common sinusitis or flu. Keep in mind there are other disorders called polyps or an infection that occurs in the nose. Nasal polyps are masses (lumps) abnormally prominent in the nasal cavity, and generally occurs due to the reaction of inflammation is prolonged. Nasal polyps occur because of the emergence of the soft tissue in the nasal cavity that is white or gray. This network can be directly observed with the naked eye after enlarged nostrils with a nasal speculum. This could be due to their childhood sinusitis, allergies and asthma. And often polyps symptoms accompanied by a sense of dizziness, cough, and runny nose and nasal congestion that usually it will complain in patients with allergic sinusitis. To cure the polyp does require quite a long time. Especially healing with drugs, but it will take longer just to shrink the polyps, when compared to surgery that can pose a risk. In the process of healing by drugs, can be given in the form of topical and oral corticosteroids by dripping directly on the part of the nasal cavity and prednisolone tablet that can be taken immediately. For those of you that are getting polyps, you should consult first with your doctor about the right kind of drug usage for your use, as well as the dose recommended by your doctor. Maybe for you that afraid of the operation, but this is the only way that can help you reduce recurrence. The operation can be done in the most cutting-edge and practical by using endoscopy (Endoscopic Sinus Surgery). In order to reduce the complications of the disease polyps, doing therapy and medical treatment to the doctor regularly. For those of you who exposed polyps as allergic sinusitis should be treated in order to reduce exposure to allergies such as dust, cold weather, food, and others. You should remain alert polyp disease, although small but if left in place for granted in the nasal cavity can be dangerous because it is located in the respiratory tract and airways more easily infected nasal cavity due to conditions that are not normal. Soft tissue in the nasal cavity that appears white or gray is the result of the initial nasal polyps. And it will also be accompanied by nasal congestion is becoming increasingly severe, and olfactory disturbances. Nasal polyp disease usually affects adults, and probably due to hypersensitivity reactions or allergic reaction of the nasal mucosa that lasts long. Another factor also allows terkenanya cause sinusitis nasal polyps which have experienced over the years, irritation, nasal blockage due to anatomic abnormalities and enlargement of the conchae. Nasal polyp disease can be treated by avoiding the causes or factors that led to the polyp. For small polyps can be treated with oral medication and inhaler sprayed on hindung. However, when large polyps are not likely to be overcome by the spray treatment, but the only way to do with the surgical removal of polyps. However, if the factors that cause polyps are not resolved properly, it is prone to nasal polyps recur even repeatedly. And that does not happen again matters worse, you are expected to hit nasal polyps can avoid some of the things that cause allergies so that the occurrence of nasal polyps.